With its sleek curved design, 5.5-inch full HD display for immersive viewing, Self Healing Technology and Android 5.0 Lollipop, the G Flex 2 offers a unique smartphone experience. 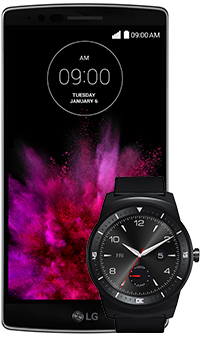 Get a G Watch R (worth £199) included at no extra cost when you buy the LG G Flex 2. This stylish Android Wear watch balances classic design with state of the art technology, delivering a watch that looks smart and acts smart. Available exclusively online. While stocks last. With its unique curved body, the G Flex 2's ergonomic design makes it comfortable to hold and brings the microphone closer to your mouth for a clearer sound. And thanks to its plastic OLED display, it's been designed to flex and bend – making it a robust, durable phone. The curved 5.5-inch, 1080p full HD display delivers an immersive and life-like viewing experience, minimising glare and reflections so you can enjoy more of your favourite entertainment. The 13 megapixel Laser Auto Focus camera captures great shots – even in low light – by measuring the distance between the subject and the camera using a laser beam. While Gesture Shot makes it easy to capture the perfect selfie with a simple hand gesture from up to 1.5 metres away. The G Flex 2 is the first smartphone to feature the Qualcomm Snapdragon 810 processor with integrated 64-bit Octa-Core CPU, making it incredibly fast and perfect for multi-tasking. It also comes complete with the latest Android 5.0 Lollipop operating system. * Recovery rate of Self Healing back cover will vary depending on ambient temperature, scratch depth and amount of wear and tear already present. Recovery from heavy scratches may be limited.